SKYLOTEC will be presenting a full range of tactical rope access technology products at the ENFORCE TAC trade fair. The manufacturer of fall protection equipment, which is designed and produced in Germany, will be presenting specially designed equipment to fulfil the demands of special units, task forces, the police and military, as well as private personal protection, at the exhibitions held in Nuremberg. The focus will be on solutions, which can be put into action rapidly and safely at any time, even in extreme situations. This includes specially developed harnesses, a range of carabiners with locks that can be turned 180° and abseiling equipment offering flexible applications. SKYLOTEC has been supplying various special solutions for tactical operations units for many years now. In combination with a few new developments, the manufacturer of fall protection equipment, which is designed and produced in Germany, will be presenting a comprehensive product line for special units, task forces, the police and military to a wide range of industry experts at the international trade fairs in Nuremberg. Tactical operations units need equipment they can always rely on in all kinds of extreme situations. This must be quick and easy to use and provide users with the best possible support. This is a critical factor when it comes to selecting equipment. One of the highlights of the product line, for example, is an extremely lightweight harness. This is a major advantage, helping to keep the overall weight of equipment down to a minimum. With its four clasps, the harness can be put on and taken off extremely quickly and is individually adjustable. Material loops for attaching equipment such as weapons or munitions holders to the harness are also fitted as standard. Padding adapted to the anatomy of the human body ensures optimum load distribution. It is extremely important for specialists working in special commando units or the military to have equipment that is quick and easy to use. 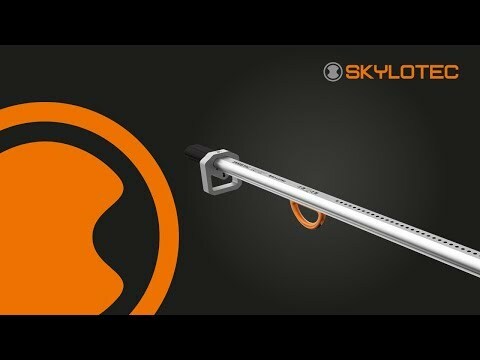 When it comes to hardware, SKYLOTEC also has the right solutions to fulfil these requirements. These include the “Double” range of carabiners, featuring twistlock and trilock locking systems, which can be turned 180° and are the first to allow the gate to be opened in both directions. A key benefit is that the carabiners can easily be opened using one hand and are also suitable for both left and right-handed use. This is a real advantage when every second counts and it means that the equipment is easy to handle, even if one hand is needed for accomplishing a mission and the carabiner needs to be released with the other hand. Members of special forces often need to be able to abseil quickly to get themselves to the right position. SKYLOTEC has a wide variety of solutions on offer, including the DEUS 3300. This is a small, lightweight device which can be worn on the body. Centrifugally controlled brakes allow safe, hands-free abseiling at a constant speed. This is ideal for the specific requirements of special forces and 3 metres per second faster than the norm for civil devices. The DEUS 3300 is intuitive to operate and ready to use at any time. The device has already proven itself in practice in the USA and is part of the standard equipment in daily use. An additional benefit is that it can be used not only for vertical abseiling, such as abseiling from a building, but also for self-rescue situations. SKYLOTEC will be presenting its product range for tactical operations units at ENFORCE TAC on 6 and 7 March in Hall 12.0, Stand 388.